← Hair, Hathor and Moon. The two Ringlets wprty give Access to the Realm of the Dead. The presence of hair in Ancient Egypt funerary belief is more than just the mane or the lock of hair. There are mentions in three chapters of the Coffin Texts to another shape of hair: the ringlets. There is undoubtedly a word game with wpw (open) and wprty; since wpt can be also the crown as the origin of the hair, the upper part of the head (and also the zenith of the sky). On the other hand, the Egyptian word wprty describes the lateral plait or ringlet that can be seen in children as a sign of youth; it is also the side lock of the god Khonsu, the god of moon. The god Khonsu with side lock. Relief from the funerary temple of Seti I in Dra Abu el-Naga. Photo: Mª Rosa Valdesogo Martín. D. Meeks translates it with a wider meaning as « lock of hair in the temple » . Taking into account that the chapter relates how the deceased gets into the Duat, it makes sense to think about the two lateral ringlets of Hathor, the Egyptian goddess who receives the dead ones in the flank of the West Mountain, when they get into the realm of the dead, and she guides them in the night sky. 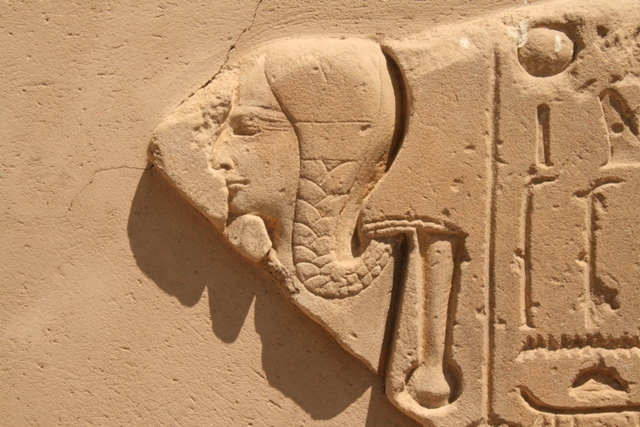 One of Hathor’s symbols of identity is her two big lateral ringlets framing her face. Apparently this image of the goddess derives from a version of the myth of the “Eye of Re”. It relates how Hathor (also Tefnut) lived in the Nubian desert as a wild lioness, while her father Re ruled alone the mankind. This one commanded Shu and Thot the mission of looking for Hathor and bring her back to Egypt. 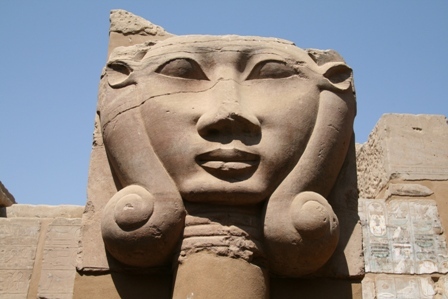 When they were in Philae, Hathor immersed in the holy water of the first cataract and she became a very pretty woman “goddess of love, with pretty face and the hair on two big ringlets, bright eyes and firm breast”. The legend of the Eye is the legend of the return: the return of the goddess from the desert, the flood after the winter, it is also the cyclic return of the agricultural prosperity. 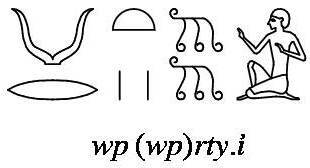 This chapter confirms the previous exposure, since the wprty are the two ringlets of Hathor. It is about the funerary goddess, the one who takes the deceased in the necropolis; she is “Hathor, the Mistress of the Occident, who rules the frontier of the desert”; she presents the two ringlets, Hathor, the lunar goddess which guides the dead in the darkness of the death. Could we think that this passage is referring to a rite? Would it be ridiculous to think of a kind of priestess or representative of Hathor in the necropolis presenting two ringlets to the mummy? If so, and taking into consideration the assimilation of Hathor with Isis in Egyptian religion, could be that woman the mourner in the role of Isis? . Thinking so, we would keep in the same line and with the mourners as the main persons of our research; we would not need to resort to a third woman, which, on the other hand, does not appear in any funerary scene. Once again we are facing Hathor as the goddess who takes the dead in, holding her arms out. When the two ringlets separate, as if they were curtains, the deceased discover her face, as if it was a window that lets the light come in; Hathor’s face gets lighter, like the moon in the dark sky. For the expression “make lighter”, the scribe used the Egyptian word , which it is also used for terms related to « clear », « silver » or « moon » . Separate the wprty ringlets means to see the moon; it is the access to the light after the darkness of the death. Hathor/moon allows the vision during the night; she illuminates, guides and takes the deceased in. It is also interesting to notice how in chapter 44 of the Coffin Texts we can read: “Heaven’s doors open with your beauty, you go out and you see Hathor” . To get into the heaven and see the goddess, either the doors get open, or the wprty ringlets get separated. It seems both elements doors and ringlets could be assimilated and interchangeable. To separate the wprty as if they were curtains allows seeing the light (Hathor’s face / moon) in the middle of the night sky. Wb I, 297, 13. It is also the part of the head new born “opens” the mother for coming to life, so it is a part related to the rebirth. We can read it in the propylon of the temple of Khonsu in Karnak. K. Sethe und O. Firchow, 1957, 67 78, 81. D. Meeks, 1977-79, II, p.94, 78.0951. According to S. Aufrère “Hathor dissimulait sa face ronde et plate d’Asiatique dans une épaisse coiffure de bédouine, aux inmenses volutes, formant la nuit de lapis-lazuli” (S. Aufrére, 1993, p. 17). E. Bresciani, 1993, p. 47. In some coffins the writing is reduced to . In the scene of resurrection in the tomb of Petosiris Isis on the left with the side lock is the “Lady of Rekhyt”, an epithet of Hathor (F. Daumas, 1960, pl. I). This entry was posted in 03. LOCKS, PLAITS AND RINGLETS and tagged ancient egypt, dead, death, deceased, egypt, funeral, funerary, hair, Hathor, Isis, Khonsu, lock of hair, mane, moon, mourner, mummy, ringlet, youth. Bookmark the permalink.